This space designed by Platt Byard Dovell White Architects and designer Tracy Bross is out of this world cool, when I saw it on Table Tonic I knew you guys would love it too. The room (photographed by Jonathan Wallen) is actually featured in the new book Room for Children: Stylish Spaces for Sleep and Play by Susanna Sulk, a compilation of over 100 stylish interiors ranging from nursery to teen. 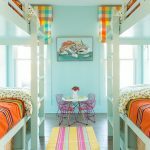 What kid wouldn’t want to spend a night or two in this bunkroom, tucked away in their own private hideaway? And I don’t know about you, but I love that turquoise and orange!!! Beautiful. Would LOVE a room just like this!! The white with pops of color is perfect here. If you have to share a room, this is the way to do it! Love this! a kid's dream… so bright and cheerful! This room is heaven! I have saved a copy of it to my pictures to keep for inspiration someday. Beautiful, I love everything about this room. I Absolutely LOVE EVERYTHING about this room! Amazing! I love it! I would probably move out of the master bedroom for a snooze in this room. Erin, what child wouldn't love this room!? Fresh and fun! Ooooh, fun for when the grandchildren start coming ! I'm saving this one – Thanks for sharing !!! 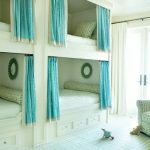 LOVE it – that would be an awesome room for a set of siblings! I guess there'll be no kids jumping on those beds – ha! Great colors, clean, fresh. A lot of open space for children to play. The window is a gorgeous focal point. Oh yes, this is exquisite…in fact, my next post will be on orange…a lovely color that can either be totally wrong, or totally cool, and in this photo, it is PERFECT! But of course, you couple almost anything with turquoise, and you've got a winner! Wow this is amazing. Thank you for sharing, I have four boys and would love to do something like this. Interesting mix of colors!! I simply loved it!! What a perfect room for grandkids to come and visit. Love the colors! Thanks for the shout out, lovely Erin! I didn't realize it was from "Room for Children" – I really must buy that book soon. I don't know what I'm waiting for, to be honest! I forgot to mention this last week, but if I could be a kid all over again, I would design a room just like this!